The flaneur is always in search for the soul of the city. And one of the best ways of getting closer to finding a city’s soul is by grabbing a camera and roaming its streets. Observing, discovering, and listening to its inhabitants. Curiously watching them go about their daily lives. Taking it to another level is usually the goal when I hit the streets. I have to prepare my mindset to get into that groove I need to be in, otherwise it's just photographing the streets. I must get into a "zone" if I even hope to come home with a keeper. I’m sure every photography who shoots street does it for different reasons. We each experience it differently, and approach it differently. We all have our own motivations and we all have our own take and style. There is no right or wrong way. Humanist Photography (street photography) for me is more than just the act, or the process. It is about the feeling. The authenticity. Shooting street photography is also mostly a solo gig for me. I am much more efficient and better focused when out on my own photographing in the streets, as opposed to being in a group with others. Although that too can be fun, and unless it is a workshop it is usually not my style. Film, video and photography has meant everything to me for as long as I can remember. 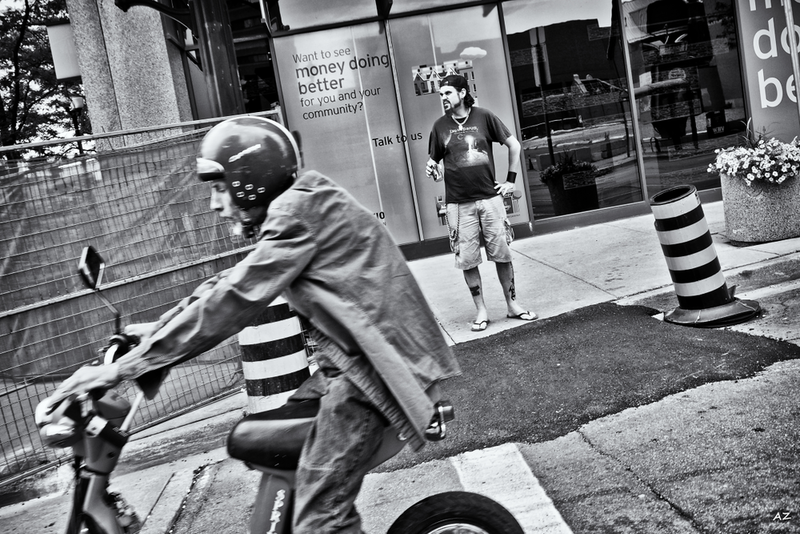 Street photography in particular (and all that that may encompasses) consumes me most of all. From the moment I wake up, to the moment my head hits the pillow it has been an obsession and a way of life for several years. I just love being out in the world, wandering the city, exploring the urban landscape, observing people, cultures, getting to the heart of it, trying to make sense of it all. Just like most street photographers, I usually carry a camera with me wherever I go. Even when I am not specifically intending to take pictures, it is good practice to always have a camera in my bag or pocket, just in case. But when I have specifically set aside a block of time to go street shooting, with no other commitments, my process starts the day before. I love the excitement of knowing I’m going to hit the streets for several hours, and the anticipation builds long before I leave the studio. Even the process of packing my bag is exciting! What camera will I take? What lenses will I want to bring along? Will I carry a variety, they are small, why not? Maybe I should take the flash. Or will I go minimalist, one camera and one lens only? If I go minimalist do I go wide? Prime or zoom? Probably a prime lens. A 35mm equivalent most likely. So if I am doing my day with only one prime lens I think about what neighbourhoods I want to see? Is there a street festival happening? Will I want to see the old city? What backgrounds do I want to include in my scenes? Maybe I'll seek out corridors, pathways and narrow walkways. No, wait, how about wide promenades with lots of people surrounded by tall buildings. What kind of people might be there? Oh, let's photograph people in hats today. What hour will that be? Where will the most interesting light fall? Will I go downtown or uptown? Do I want crowds or sparse streets? Maybe I’ll venture down some alleyways. A few lesser known backstreets. Discover the underbelly of the city. What will happen? What will I see? Will I capture the one-frame-story? Will I be lucky and capture the decisive moment? Will I find truth? Will I get out alive? I get giddy, like a child, just at the thought of it all. I’m getting excited right now thinking about it. Road trip! One of the reasons I enjoy street photography so much is that it has a way of bringing me into a state of hyper awareness. Of truly being in the moment. This takes a certain level of focus which for me requires a degree of meditation. And therein lies part of the process. Currently I live less than a one hour drive from Toronto. It is a bustling place, culturally diverse with no shortage of subject matter and visual stimuli. I usually take the train or bus into Toronto which gives me time to focus on relaxation. A chance to breath and quiet the mind. I have noise cancellation headphones that really help. I take a window seat and watch the world go by for an hour. I'm fairly easy going, not much bothers me I have to say. So relaxing on transit is second nature. I can tune out and focus on my breathing. This is my time. Next I'll turn on the mp3 player and start scrolling through the song list. Music is very important to me. I grew up with music all around me -- many of my family members are professional musicians. Including both my parents. I also work in the "biz", so my tastes are wide and varied. Depending on my mood I usually listen to jazz or classical music. 70's rock is also a favourite. But there is nothing like listening to epic movie soundtracks, which have a magical way of getting me into a creative bubble. That bubble is where I like to be when I’m in the streets. Music helps me get there. By the time I arrive at Union Station I usually have a pretty good idea where my feet will take me. This may have been pre-planned or I may just be flying at the seat of my pants without any preconceived ideas, targets or direction. Either way, whichever direction I decide to go I need to ease myself into the flow. I must climb into a special state of mind before I take my first photographs. Once I find that "zone", I can let myself go and begin to feel the rhythm of the city. Part of the objective is removing distractions from the mind. Leaving any stress of daily life behind. Focus on what is around me. In front of me. I know I have found the "zone" when I can react with my camera without thinking too much. Where composition, lighting, subject matter - the story - become the focus. Intuition starts to take over becoming my internal guide. This is the hyper awareness I speak of. 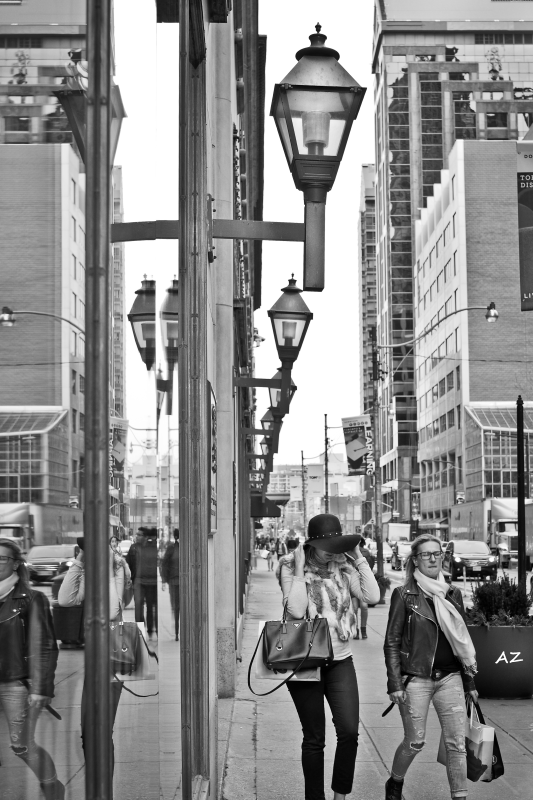 I try not to over think things while shooting in the streets, as it can be counterproductive. If I find I’m analysing too much or intellectualizing what I am doing, what I am capturing, and how, I will miss the shots. If I am too self-conscious then it means I am not in the “spell” or the zone. Yes, one does need to balance these states of mind. Analysing is good when searching for the right composition, but I prefer to react with instinct and feeling which enables me to truly “see”. It is about being open to possibilities as they present themselves in those mere milliseconds. It takes practice learning how to surrender control. But when you do, it is to your best advantage. Because understanding that you have NO control in what happens in the street, no control of the many factors, can actually be quite liberating. You'll soon discover your other senses becoming sharper. You're quick to respond. Those moments are so fleeting that if you are truly not “there”, present and in the moment, free of distraction, the efforts are fruitless. Even when I am not travelling the hour up the road to Toronto, I will take time and walk closer to home just to get out and clear the mind. It isn't always about hunting for the best shot. It is really about getting to know your city or town or village, and the people and things that make it unique. It can be quite a zen-like experience if you empty your mind of distraction, walk slower, and remove the pressure off yourself in having to find that perfect shot. Street photography is all about appreciating the beauty in the mundane and if you walk with your camera in hand, the pictures will come. If you leave it in the bag, well, they won't. It's pretty simple. So clear your mind. Breath. Be in the moment. Anybody, artists in particular, can find something useful in the teachings of Zen/Taoism/Buddism. Zen Buddhism is non-theistic, its emphasis is on realizing the nature of the self. It is learning how to be more peaceful. Tranquil. It has nothing to do with worshipping a "creator" or "god". Zen's rituals point to the oneness of the self and the ten thousand things. Like meditation, Zen functions as a way of uncovering the truth which is the life of each one of us. It can remove restrictions to creativity. 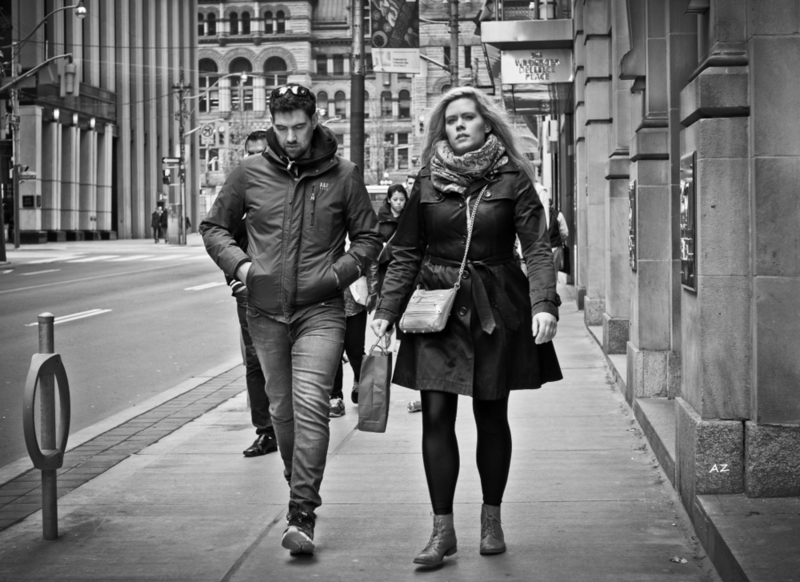 Street photography (humanist photography) is about documenting society in an aesthetic way. Having a zen-like approach to your photography will allow your own "street photographers voice" to mature - and the cumulus of all your cultural background stories will help shape and define that voice. 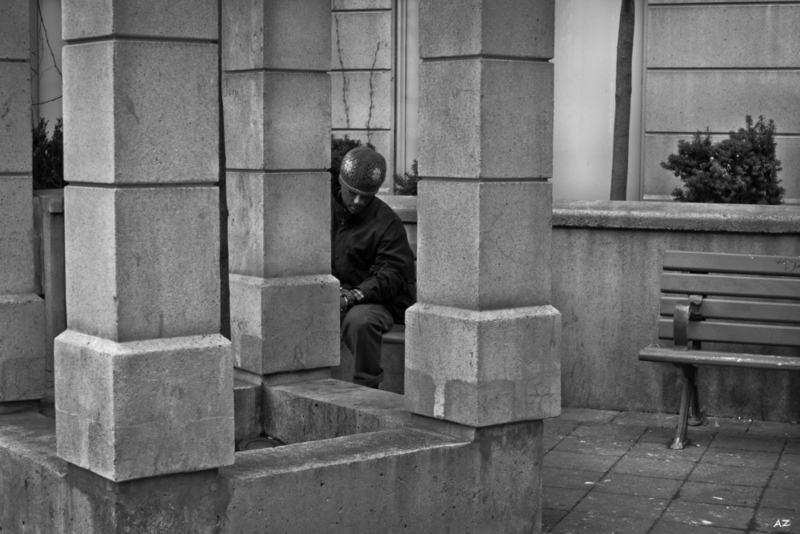 Becoming a good street photographer takes a great deal of inner discipline. It is a mindset. It is about capturing images that matter to us and then sharing them with the world. Whether the world responds positively or negatively is not our concern. We have no control in all that. It isn't about satisfying clients’ needs, concepts or looks; we are capturing meaningful stories that matter to us – life as it unfolds. When I introduce Zen into my work, I find it calming, peaceful and yes even playful. I've been working on a series that encompasses the ideals of "Contemplative Photography" based on the Miksang theory. This works well for street-style shooting. Named after the Japanese art of finding beauty in imperfection and impermanence. The two words are usually joined together, but they have separate meanings: “wabi,” quiet contentment with simple things, and “sabi,” the graceful aging of things, like weathered wood or an old vehicle left out in a field. "[Wabi-sabi] nurtures all that is authentic by acknowledging three simple realities: nothing lasts, nothing is finished, and nothing is perfect." What is miksang? Miksang is an art form centred on Contemplative Photography. Miksang is a Tibetan word that translates as “Good Eye” and is based on the Shambala and Dharma art teachings. Miksang, at its most basic level, is concerned with uncovering the truth of pure perception. We see something vivid and penetrating, and in that moment we can express our perception without making anything up—nothing added, nothing missing. Totally honest about what we see—straight shooting. It is a blissful experience to be free of worry for a few hours and be one with my camera. When the camera becomes an extension of myself it becomes a conduit to my creative mind. I experience what can only be described as a “natural high”. This is when I can almost predict the scenes just before they unfold. Where happenstance and luck meets readiness. As if time has slowed and instinct takes over - when all the right elements come together in the frame and I know precisely when to press the shutter button. This is when I know I’m truly in “street mode”. I’m now in the zone. Relaxed, open and energized.